Uniforms & Workwear | Xylem Inc. Even on internal applications such as clothing, it is important to maintain the brand structure with correct sizing, placement and colors of signatures and taglines whenever possible. Several examples of uniform applications are shown below, including work shirts, coveralls, lab coats and hard hats. Every effort should be made to match specified Pantone values (see Color Palette) when choosing colors for fabric, screenprinting or embroidery. White, gray, black and Xylem blue are preferred colors for uniforms; however, other colors may be used if required by local law or mandate. 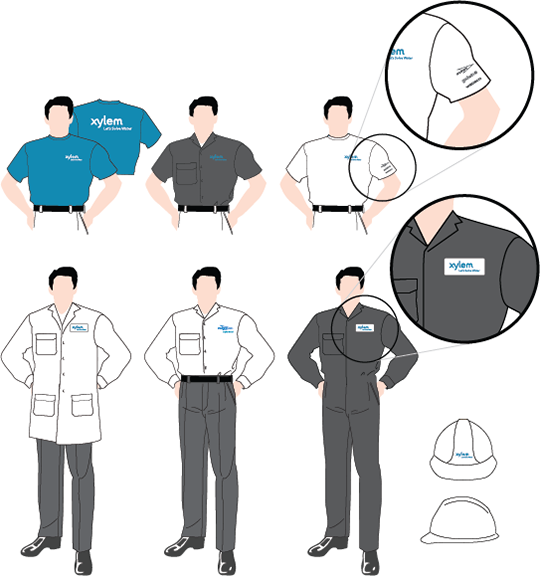 All employee uniforms should carry the Xylem logo embroidered or screenprinted on the left front chest area; however, employees who interface directly with customers in a sales or service capacity can use a single product brand/Xylem lockup in this area instead. When multiple product brands are required, the Xylem logo should remain on the chest, and product logos should be placed on the sleeve in gray, white or black only. Do not use color logos, and do not use product brand/Xylem lockups when multiple product brands are shown. On the back of a uniform, it is acceptable to place a larger, up to 10 inches (25 cm), Xylem logo or single product brand logo when necessary. Safety messages (“Accept Only Zero”) can also be placed on the back of uniforms, but should be used in a limited capacity. Refrain from placing additional logos or messages on uniforms. For most applications, 3.5 inches (9 cm) or smaller is an adequate size for a logo placed on the chest area of a uniform. If screenprinting is employed at this size, use the Xylem logo with the “Let’s Solve Water” tagline. If embroidery is employed at this size, use the Xylem logo without the tagline, since embroidery may not accommodate the small size of the tagline. In some instances it may not be possible to apply the logo directly to the fabric. In these cases an embroidered patch may be appliquéd to the uniform. A patch that is 3.5 inches (9 cm) wide or smaller is an adequate size to apply to the chest area of most uniforms.